Who Is Banjercito? And Why Do I Need to Know About Them? Posted November 14, 2017 by Roxanna Brock McDade & filed under Border Crossing, Driving to Mexico, Vehicle Import Permit. When it comes to importing a vehicle into Mexico for temporary use, you need to know about Banjercito. Are you traveling to Mexico soon and need more information? Keep reading. Banjercito is a military bank that helps individuals obtain temporary importation permits for vehicles being brought into Mexico by those visiting the country. If you intend to travel into Mexico past the “free zone,” obtaining a permit is vital. And failure to obtain one could result in the surrender your vehicle to Mexican authorities. Fortunately, these permits cost approximately $44 USD plus taxes and will cover your vehicle for trips and temporary stays in Mexico. Original/ photocopy of Driver’s License issued outside of Mexico. A Mexican immigration permit, such as a tourist, business or immigrant permit for non-Mexicans. The original and duplicate of Bill of Sale, Deed to Property and Vehicle Registration issued by a foreign authority in the applicant’s name. Also, if the title is in the name of a spouse, child or parent, you must present a birth certificate or marriage license. If the vehicle is leased, bring the lease contract as well as a notarized letter of consent from the leasing company. If the vehicle is financed, bring the credit contract as well as a notarized letter of consent from the lien-holder. If you’re driving a company car, bring a notarized letter of consent confirming employment and authorizing the employee to import the vehicle into Mexico. Provide proof of provisional Mexican auto insurance for your automobile. Overall, getting a TIP can be easy if you follow this short guide. Moreover, when you are finished with the permit, simply return it to any Banjercito Bank located on the border. Get more information about getting a Temporary Importation permit on our website or from the Mexican government’s information page. Arizona, California, New Mexico, Texas. Want to stay in mexico for 1 year permit only for 6 months how i make for a year????? My girlfriend and I are crossing down to Panama with a RV, an 8′ enclosed trailer with 2 motorcycles in it. How many vehicles does a TIP cover? Can we each get a TIP for the multiple vehicles? Please contact Banjercito, as we have no association with them and do not want to give you the wrong information. Phone: 555-328-2354, Email: banjetel@banjercito.com.mx, Website: https://www.gob.mx/banjercito Thank you. Hi there, I applied online for a TIP on the 5th of December, Online it says My folio number case it’s been approved. But I didn’t received nothing yet… no mail, no email… Do you think you can get the actual sticker/permit at the border Showing the Folio Number? We are not sure about the answer to your question, but you can try to call or email Banjercito at Phone: 555-328-2354, Email: banjetel@banjercito.com.mx, Website: https://www.gob.mx/banjercito. How do I dial that number from the United States? First dial 011 – the U.S. exit code. Next dial 52 – the Mexico country code. Then the area code – 2/3 digits. Finally, the phone number – 7/8 digits. Did you ever find out why you didnt get the vehicle permit? I recently acquired a TIP online for my SUV and 20′ travel trailer. After checking yes in the box asking if towing a trailer the only option in the next box was boat trailer. After retrying three times I thought it was a glitch so I put my trailer vin. in the appropriate space. When I got the TIP in the mail the trailer is listed. But reading this and other blogs. I went back to get a separate TIP for the trailer. But I get blocked right at the beginning with alert saying that that my previous TIP has not been returned. Question is am I ok or is this a problem? My wife and I recently rode our motorcycles into Mexico. We acquired TIP for both bikes paying a deposit for both on the same credit card. Both TIPs were returned at the border in Nuevo Laredo, but we have only received deposit returned. Any idea how we request the return of the second deposit? You should contact Banjercito using one of the following: Phone: 555-328-2354 or Email: banjetel@banjercito.com.mx or Website: https://www.gob.mx/banjercito. Thanks. Can anyone tell me where I return my vehicle permit when I cross on the ferry from Mazatlan to La Paz. I will be heading north from there to the US border crossing into California. You would return it at the U.S. border (https://www.mexpro.com/mexico/vehicle-import-permit.html). my Husband haa a residentsy an wants to travel to mexico San Luis portosi but he doesnt have a drivers liscense an the truck he wants to take is in my brother N Laws Name how can i get a permit for him to take it to Mexico for acouple of weeks for vacation. When I try to put in my document number in the banjercito website is says its invalid number. is the website not working? You must contact Banjercito (phone: 555-328-2354 or banjetel@banjercito.com.mx or https://www.gob.mx/banjercito). We have no association with them, as they are a Mexican government agency, and so cannot properly or thoroughly answer your question. Thank you. Requested and paid for permit online on 11/20/18. Never received any email back advising of any kind of receipt of the documents/funds, the Banjercito site has been down since. They already took the funds from my account. Is this normal? You must contact Banjercito (phone: 555-328-2354 or banjetel@banjercito.com.mx or https://www.gob.mx/banjercito). We have no association with them, as they are a Mexican government agency, and so cannot properly or thoroughly answer your question. You could also contact your bank regarding the charge. You will need to go to the Banjercito office on the border of Mexico to get it and you can go the same day. Here is the list of Arizona border crossings (https://www.mexpro.com/blog/cross-u-s-mexican-border-arizona) and the one’s with Banjercito offices (also called Aduanas) are listed with hours of operation. I hope this helps. What do I need to import a small trailer 2013 from Canada to Mexico, if I am a Mexican citizen and a Canadian Permanent Resident? I am assuming you will apply for a Temporary Vehicle Importation Permit just like everyone else (https://www.mexpro.com/mexico/vehicle-import-permit.html), but we are not the experts. Since Banjercito is a Mexican government agency you may want to contact them https://www.gob.mx/banjercito (by phone: 5553282354, email: banjetel@banjercito.com.mx). Credit Contract no older than three months. You likely can bring a photocopy, but to be sure you may want to contact Banjercito here or at banjetel@banjercito.com.mx. I went a cross one time with my registration, but in Mexico every day changes, so to play it safe I would get into the internet. I want to drive my motorcycle from the USA straight through Mexico and into Guatemala – what documents do I need? We do not know what you need to drive in Guatemala, but the documents described here are what you need to travel through Mexico. This will be my first time going to Mexico to visit my husbands family. I will be traveling to Mazatlán, Sinaloa. Will I Need a permit to drive my truck in Mexico. Also I don’t have a Mexico tourist pass. Where can I get one? 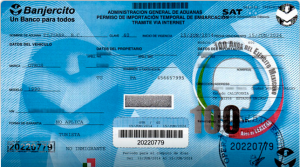 You will need a temporary vehicle importation permit to drive to Sinaloa from the US. You can get one at border locations that have Banjercito offices or you can buy one online at Banjercito.com. You do not need a visa to visit Mexico if you are a citizen of the US or Canada. Find the list of countries except from a Mexican visa here. Can I bring a 2016 3/4 ton truck that it’s diesel I heard that they where not allowed anymore ? Thank you for your question. We are not aware of this change, however, you should contact Banjercito to be sure, since they are the Mexican Federal agency who controls, monitors and polices the TIP process. If you don’t mind, please let us know what you find out so we can help anyone else with a similar question. We bought a new car and are waiting for title and registration to come in the mail. We still have not gotten it yet and plan to leave to MX July 8 is there anything we can do? You likely cannot get a TIP. Your best bet would be to contact Banjercito to see if there’s something else you can do. We are not associated with that government agency so cannot give advice on subjects for which we have no experience. Is there anywhere in Nebraska that does permits for vehicles? I don’t have a passport . I am an American citizen. My passport was denied. Help! I’m sorry we are not associated with government agencies. You will need to contact the US State Department to get help: https://travel.state.gov/content/travel/en/passports.html.